"I bow to Sarasvati, the boundless ocean of mercy, who holds in her hands the Veena, a rosary, and the book of knowledge." 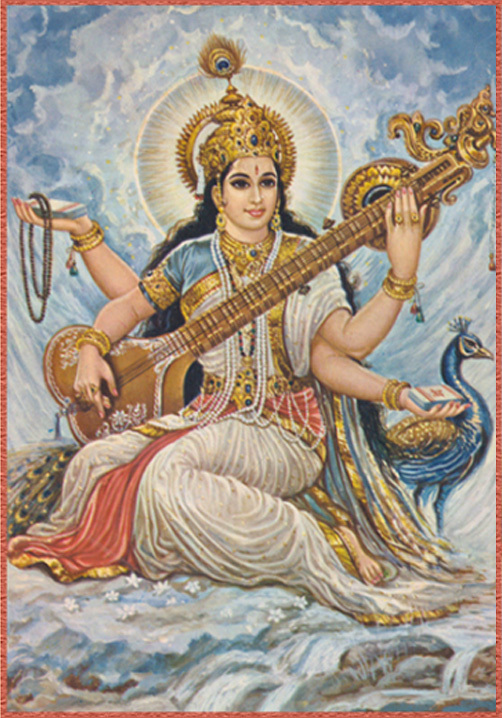 Sarasvati is the Goddess of wisdom, knowledge, the arts, and all sciences. She is the Goddess of speech and the patroness of poets, writers and artists of all kinds. "Consciousness, the Self, is brimming with immense joy. It has no cares, no old age. It radiates constantly, never fades. That is your true home, in which you dwell forever."